Making an appointment is easy. 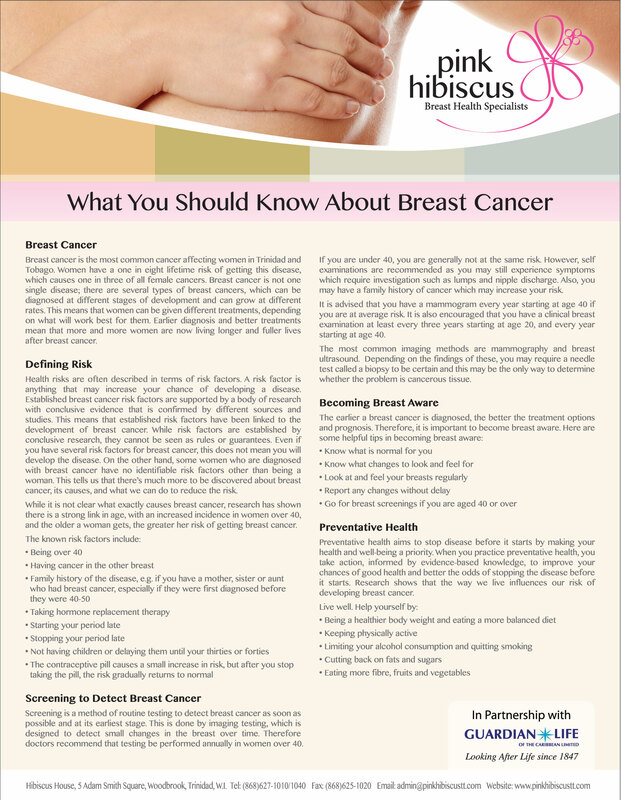 If you are a woman aged 40 or older you can self-refer yourself to Pink Hibiscus for breast screening. Women under the age of 40 require a referral from their doctor. To prepare for your appointment, please wear a two-piece outfit, as you will be required to remove your top only. A gown will be provided if preferred. You are advised not to wear deodorant body lotions or talcum powder under your arms or near your breast as these products show up on the images. You will be welcomed by a Pink Hibiscus staff member who will explain what happens at the Specialist breast Centre. Our Screening staff will be there to support you during all stages of the screening. Should you have any additional questions or concerns prior to your appointment please give us a call or email us. If your doctor has referred you for a mammogram or ultrasound, please telephone our office directly to arrange your appointment. Same day appointments can usually be arranged for urgent referrals. Once you are registered with Pink Hibiscus, you will be sent an annual invitation to attend your screening appointments. Please complete the information required below. Upon submission you will be contacted within the next business day to book your appointment. Please leave a description of what services you will be requiring in the comments section. You can also give the gift of screening to a loved one with a Pink Hibiscus gift certificate - just give us a call at 627-1010 and we'll make the arrangements for you!